NASA has picked two new low-cost missions for launch in 2017: a planet-hunting satellite and an International Space Station experiment designed to probe the nature of exotic, super-dense neutron stars. The Transiting Exoplanet Survey Satellite (TESS) and Neutron Star Interior Composition Explorer (NICER) are the latest missions chosen under NASA's Astrophysics Explorer Program, which caps costs at $200 million for satellites and $55 million for space station experiments, officials announced Friday (April 5). The TESS spacecraft will use an array of wide-field cameras to scan nearby stars for exoplanets, with a focus on Earth-size worlds in their stars' habitable zones — that just-right range of distances where liquid water could exist. "TESS will carry out the first space-borne all-sky transit survey, covering 400 times as much sky as any previous mission," principal investigator George Ricker of MIT said in a statement. "It will identify thousands of new planets in the solar neighborhood, with a special focus on planets comparable in size to the Earth." As its full name suggests, TESS will detect alien planets by noting when they transit, or cross of the face of, their host stars from the instrument's perspective. 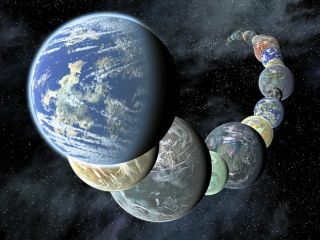 NASA's Kepler spacecraft has used this strategy with great success, flagging more than 2,700 potential exoplanets since its March 2009 launch. Unlike the free-flying TESS, NICER will be mounted to the space station. From this perch, it will measure the variability of cosmic X-ray sources, potentially allowing scientists to better understand neutron stars, which are the ultradense collapsed remnants of exploded stars. NICER's principal investigator is Keith Gendreau of NASA's Goddard Space Flight Center in Greenbelt, Md. Both missions should advance scientists' understanding of the universe, NASA officials said. "With these missions we will learn about the most extreme states of matter by studying neutron stars, and we will identify many nearby star systems with rocky planets in the habitable zone for further study by telescopes such as the James Webb Space Telescope," John Grunsfeld, NASA's associate administrator for science in Washington, said in a statement. NASA's Explorer program aims to provide frequent, low-cost access to space for investigations relevant to the agency's astrophysics and heliophysics programs. More than 90 missions have launched under the Explorer program since the first one, Explorer 1, blasted off in 1958 and discovered Earth's radiation belts.